“Al Nasrani” from Christian Faith Publishing author James Denning is a Christian legend straight out of ancient Syria. The translation of the first of five scrolls found within a grave site, “Al Nasrani” shares the tale of a German knight and Crusader who defends the beloved people he once tried to conquer. 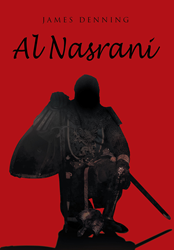 “Al Nasrani”: a translation of an ancient scroll detailing the legend of Al-Nasrani. “Al Nasrani” is the creation of published author, James Denning. Redeemed by the blood of Jesus, James is a son of the Old South as well as a lover of history from Creation to Kingdom Come. James Denning loves reading, writing, and running. He is a docent at an historic antebellum mansion in West Point, Mississippi. He holds a BA and a M.Ed. in History from Delta State University. James Denning attends Border Springs Baptist Church where he sings in the choir. He lives in Caledonia, Mississippi. Published by Christian Faith Publishing, James Denning’s new book recounts a legend born in history. In the land near Aleppo, there is a legend of a Christian amr, Al-Nasrani. Amid the chaos and destruction of the Syrian Civil War, researchers investigate an ancient burial site, guided by the descendants of Al-Nasrani. Among the bones, to their surprise, they find five clay jars that have been sealed for centuries. Secretly shipping them out of the country to a safe location, they discover scrolls within each of the jars. Only years later, as the war ends, are they able to reveal the contents of these scrolls. “Al-Nasrani” is the translation of the first of these five scrolls, a dramatic account written by Ephrem, the second Amr, about how his father came to be lord of Al-Mansura. View a synopsis of “Al Nasrani” on YouTube. Consumers can purchase “Al Nasrani” at traditional brick & mortar bookstores, or online at Amazon.com, Apple iTunes store, or Barnes and Noble. For additional information or inquiries about “Al Nasrani”, contact the Christian Faith Publishing media department at 866-554-0919.